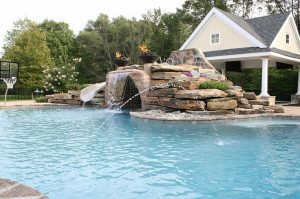 As summer approaches, you may be anxious to improve the curb appeal of your home, create an relaxing outdoor oasis or design an entertainment area. However, you may have no idea where to start. The experts at the Fort Worth landscaping company Blooms Landcare are familiar with the top landscape trends for summer. They can help you create a lawn and garden design you will love. The current trend in landscape design involves a blending of architecture and nature. While it may be easy for you to select garden structures and outdoor furniture for your yard, you may need some assistance in choosing the plants. There’s a move toward incorporating native plants, shrubs and wildflowers in your landscape design. You’ll need to know what plants will thrive in your specific location in order to make the best choices. A popular summer trend is to have less grass in your landscape. Wildflower meadows and flower beds are filling more of the lawn space. It’s also very popular to extend or create gravel or stone areas where you can place furniture and some impressive container plants. This area becomes your entertainment area where family and friends can gather for cookouts, parties and fun. To keep your landscape looking beautiful, it’s essential that your flower selection involve seasonal color installation. Professional landscapers can advise you about succession planting. Many of the early spring flowers have lost their beauty by the time summer flowers are ready to be planted. Fall flowers can be planted near the end of summer to extend the beauty of your lawn or flower beds. Vertical gardening is very trendy right now. You can enclose a small area of your lawn with trellises and climbing plants to create a relaxing, semi-private oasis. More people are including vegetable plants in their landscape. These can be mingled in with your flowers or grown in separate beds. You don’t have to worry about knowing what to plant. Just give the professionals at Blooms Landcare a call at (817) 688-5352 and let them assist you in making the best choices for your lawn.